With all the varieties of sheds available, a person is sure to find the one those suites them best. With the ability to customize the selections, there should be unique models for everyone. No two need look alike with the combinations of choices available. One option that can be customized is in the roof style. There are basically three styles, varying in their shapes. There is: apex, pent, and barn styles. This is the traditional triangular-shaped roof. It has a varying degree of slope, peaking in the middle, forming a gable. This one is good to keep rainwater running off, which preserves the roof. This one also looks more like a traditional house, and can be matched to the main residence if so desired. This one is sometimes a lean-to style because it can be snugged up close to the exterior wall of an existing building. It has a high side that slopes to a lower side. The high side can be snugged against a building, lean-to style. The degree of slope helps to drain rainwater. The slope can vary, but should be deep enough for good drainage. This style looks like a post-and-beam barn. It has a sloped roof that peaks in the middle then drops off at the sides to form or overlap part of the side walls. They look just like a smaller version of a barn, and are often painted to look like the traditional red barn. The great varieties of sheds means there are any number of possible uses. Some are used as garden sheds to store garden tools. Other are used as bike sheds, to store and protects the owner’s bike or bikes. Some are designed as summerhouses and others as children’s playhouses. For added outdoor space, they are the perfect solution. 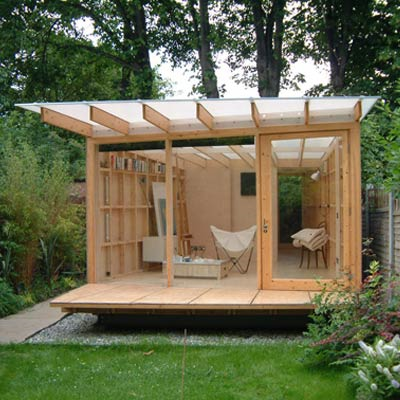 Part of the customization of sheds involves the materials of which they are constructed. There are three major materials used in the construction of sheds. There is wood, plastic, and metal. It is up to the owner which material they prefer, based on budget and other factors. Architectural style is another way to customize the varieties of sheds available. These styles are dependent in par t on the look desired, as well as in the use of the shed. There are two basic architectural styles, which are post-and-beam and lean-to. This style is just as it states. There are vertical members (posts) secured to the foundation, and horizontal members (beams) connecting them and giving the basis of construction of walls and the roof. This style is commonly used in barn style sheds. This style has a roof that is higher on one side and lower on the other. It is designed to be snugged up against the exterior wall of another building, hence the designation lean-to. Wayne is a hobby farmer who has investigated all the varieties of sheds that a person might need on a small plot, whether it is for gardening, animals, poultry, or even kids. Find out all about the many different styles and uses for sheds by reading his articles.